Among the many lessons from 2016 that Democrats are trying to embrace ahead of the 2020 presidential election is that they cannot afford to ignore the Midwest. The party made it clear that the region would be a priority in the next presidential campaign, selecting Milwaukee, Wisconsin, earlier this month as the site for the 2020 Democratic National Convention. 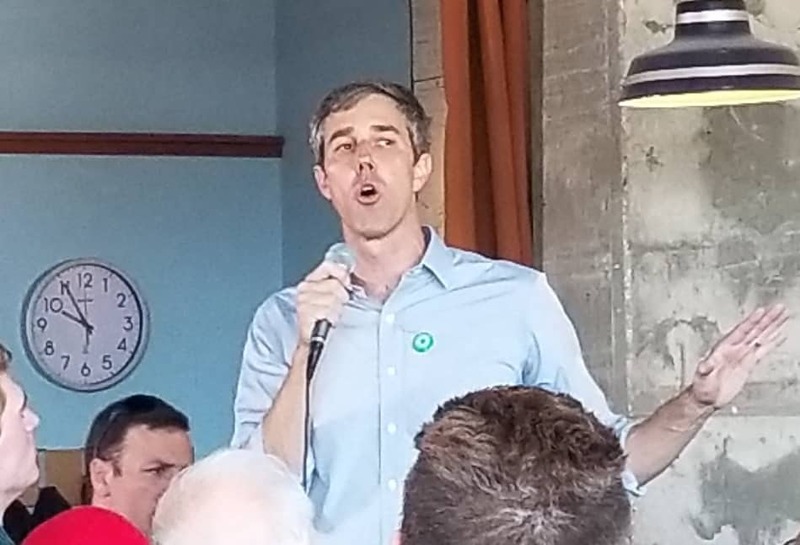 Notably, candidates who have jumped into the race for president are also making great pains to court Midwestern voters — including Beto O’Rourke, who spoke at Cargo Coffee in Madison, Wisconsin, on Sunday morning. The thrice-elected former Congressman from El Paso, Texas, has made two trips to Wisconsin’s state capital already, once while contemplating a run for higher office, and the other on Sunday, just a few days after he made his presidential ambitions official. With temperatures in the low-30s on Sunday, Madisonians waited outside of Cargo Coffee, just a few blocks from the state capitol building, to hear O’Rourke speak. The crowd inside the building had already reached capacity levels by 8:30 a.m., one hour before the candidate was set to speak. Despite no room inside, revelers waited outside the giant glass windows of the building, hoping to catch a glimpse of O’Rourke. They got more than that — the former Congressman entered the building through the crowd gathered outside, and stood on a chair to speak to them briefly, thanking them for coming out before entering the building to address to those gathered at the cafe. Once inside, the crowd started chanting “Beto!” as he made his way to the main stage. Audience members gathered in Cargo Coffee, which is a popular spot for Democratic Party events, were all smiles upon his ascension to the front of the room. The candidate spoke about a myriad of subjects, including access to education, universal healthcare, a stronger economy for workers rather than corporate interests, the threat of climate change, the need for gun control legislation, and an overall change to how our democracy works — ensuring it does so for the people rather than the privileged few. “This democracy must work, it must represent and reflect everyone. That’s why in this campaign, we’re not taking a single dime from a single political action committee,” O’Rourke said. Immigration was another hot topic for O’Rourke. “Yes, let’s be nice,” O’Rourke responded to the child with a slight grin on his face. He then took on a serious tone as he tried to tackle the subject in depth. “The way in which we treat each other, Sam, the words that we use, those are so important,” O’Rourke said. “Donald Trump, who talked about Mexican immigrants as rapists and criminals, who sad that Klansmen and neo-Nazis and white supremacists were ‘very fine people,’ who promised to ban all Muslim travel to the United States of America…there are real consequences” to what the president says, O’Rourke said. The feelings and sentiments of onlookers as he answered people’s questions said it all: This is a candidate who is worthy of voters’ attention. Madisonians who went to hear him speak hung onto every word that O’Rourke said. And O’Rourke will likely be able to do the same throughout the months ahead, at campaign stops throughout the country, judging by the way he spoke on Sunday morning.